I have found that my two year-old does better in unfamiliar situations when I narrate for her. When we are on our way to whatever activity it is, I explain, to the best of my ability, what she can expect and what I expect of her. When talking with TCK counselor, Josh Sandoz, he mentioned the idea of not just narrating expectations, but more importantly, narrating your child's feelings. This is particularly useful when you are moving overseas and entering a land of many unknowns. Young children have not yet learned to reason through their thoughts and feelings, so when they are overwhelmed by them, they can act out or shut down. I have seen many parents surprised at how severely or uncharacteristically their child reacts when moving overseas. Sometimes these behaviors last well into the first year in the new culture or even beyond. Narrating your child's feelings is one way to help them work through the challenges that they don't have the words or maturity to work through on their own and it combats their natural response to act out or shut down. "Wow! That was a really long flight and I'm sure you are very tired. I'm feeling a bit grumpy because I'm so tired, but I bet when we sit down and get some food we will all feel better. How are you feeling, son?" "Your new school will probably be very different from your old school and that might make you feel a bit anxious and uncomfortable. After you have been there for a while it will probably start to feel more normal, but it is ok to not love it right away." "When we go to the market, there will probably be a lot of people and because you have light skin and hair, they may touch you. I know that it makes you feel mad when people touch you who you don't know, so when you start to feel that, squeeze my hand and we'll find a place to go and take some deep breaths." 1. Choose small, digestible feeling words that your children can grasp. Over time their feeling word vocabulary will expand, but when you are using narration in already potentially overwhelming situations, stick to words that they already know. When they are in more comfortable, predictable situations, look for ways to narrate for the purpose of expanding their feeling word vocabulary. If you do this regularly, then you will have a larger word pool to pull from when you’re in more challenging situations. 2. Don’t assume that you know what your child is feeling. For very young children, you may need to tell them what they might be feeling (see Examples 2 & 3), but with older children, take the time to ask them how they feel in a particular situation. In this scenario, narrating might be describing your own feelings with the intention of normalizing those feelings for your child (see Example 1). 3. Give them permission to feel. Narrating should normalize and validate feelings, not tell them why they shouldn’t feel a certain way. Look at Example 2. In the example, the child’s feeling is acknowledged, validated, and they are given permission to feel negative feelings. It can be tempting to instead say, “Your new school will probably be very different from your old school and that might make you feel a bit anxious and uncomfortable, but there’s no reason to feel that way! You’re going to love it in no time!” While this example may seem harmlessly optimistic, it communicates to your child that they are not allowed, or don’t have a valid reason to feel anxious and uncomfortable. This not only doesn’t take away their negative emotions, but may also keep them from sharing them with you in the future. 4. Provide a solution. See Example 3. The parent foresees that the child may encounter a situation that may be a trigger for anger, but instead of saying, “Don’t get angry.” (which may be difficult or impossible for a child to control and also isn’t healthy), give them a solution (“When you start to feel angry, squeeze my hand and we’ll find a place to go and take some deep breaths”). This teaches them to work through their negative emotions in healthy ways- a practice that has life-long benefits! The purpose of doing this emotional narrating is to normalize and validate your child's feelings, give them an appropriate way to work through that feeling, and show them that you experience uncomfortable and overwhelming feelings as well. While you may not be able to predict what every situation will look like (especially when you are in an unfamiliar culture yourself!) you do know a lot about your child and may be able to anticipate what negative emotional triggers they might encounter. Not only will this help your child, but you may find that this practice helps you to expand your own self-awareness and adaptability, creating an even greater sense of security for your child. Everyone who's traveled knows the spiel. "In the event of a decompression, an oxygen mask will automatically appear in front of you. To start the flow of oxygen, pull the mask towards you. Place it firmly over your nose and mouth, secure the elastic band behind your head, and breathe normally. Although the bag does not inflate, oxygen is flowing to the mask. If you are travelling with a child or someone who requires assistance, secure your mask on first, and then assist the other person." You know you're a TCK when you can write that from memory. This protocol is not only useful for decompressed aircrafts, but is also an important illustration for parenting children overseas. Parents are often concerned about the wellbeing of their children, as they should be, but it is equally as important for parents to be concerned about their own wellbeing. If your own oxygen mask is not secured first, then you are not going to be helpful to your child. If your own emotional and physical needs are not well tended, you will not be able to be the parent that your child needs you to be. This is particularly true when you are moving and living overseas. It can be very easy to sacrifice your own emotions and needs on the alters of productivity and caring for everyone else. It might even seem more godly, or holy, or selfless, or strong to forgo your own struggles for the sake of your children, but not only is this not sustainable, it teaches your children to do the same. Children are the world's best copy-cats. How you process your own emotions and work through challenging situations directly impacts how your child will do so. This doesn't only impact their "little years" but sets the patterns for the rest of their life. Because adult TCKs deal with a significant number of unique challenges, the way that they learn to deal with emotions at a young age is incredibly important. If a child who lives overseas watches her mother or father ignore their own needs and emotions, she will be more likely to do the same as a child, teenager, and adult. As they imitate you, they are not only learning how to work through their own feelings, but are also developing the ability to empathize with others. In traumatic or uncomfortable situations, like moving overseas or sitting in a oxygen-leaking airplane, you have the opportunity to choose how you are going to respond. As a parent, the natural response is to get the oxygen mask on your kid, to make sure they are transitioning well, to tend to their grief as they move to a new country, and to help them wade through the uncharted waters of living in a new culture. However, it is critical that this natural response is consciously and continuously reversed and you first take stock of your own emotions and needs. So, what does "putting on your own oxygen mask" actually look like? 1. Pause and listen to your thoughts. 2. Name your feelings. Are you frustrated, anxious, nervous, sad, afraid? 3. Ask the "Why?" What is the source of these feelings? 4. How is that feeling affecting you? Are you more short with your children? Are you slamming doors? Is your tone of voice different because of your feelings? 5. Respond. Now that you have taken stock of your current emotion and how it might be affecting you, work through it. Do you need a good cry? Some alone time? A cup of coffee? Find a way to tend to the emotion in some fashion. Avoid ignoring it, and instead work through it in a healthy way. Perhaps even say to your child, "Mommy/daddy is feeling a bit frustrated right now and needs to take some deep breaths and drink a cup of tea. Would you like to do that with me?" This is the process of putting on your own oxygen mask, so to speak, so that you can then tend to your child's needs more effectively. 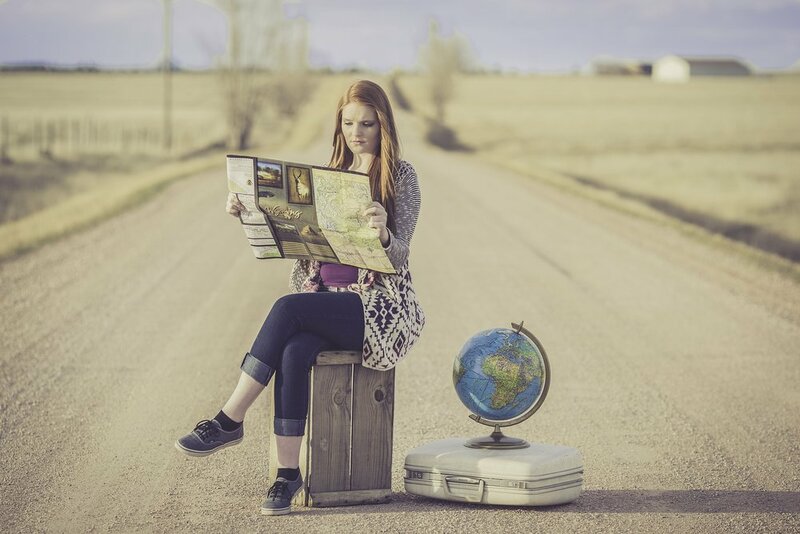 When you, the parent, are going through the transition of moving to a new country or working through the challenges of living overseas, don't hold your breath and push through it for the sake of helping your child. Instead, put on your own oxygen mask first, take a deep breath, and then tend to your child. The chances of long-term emotional survival are much higher for both the parent and the child when the parent is willing to do the work of tending to their own needs.